We’re all guilty of it at times. Whether it’s reading a report, sitting through a meeting or listening to a classroom lecture, we’ve all realized, with a start, that our minds have wandered. 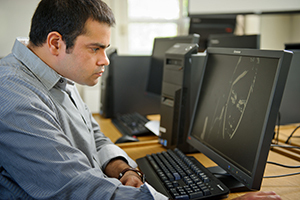 University of Notre Dame researcher Sidney D’Mello and colleagues are researching this “mind wandering” phenomenon and developing a software system that can both detect when a person’s focus shifts from the task at hand and get that person to refocus. People’s minds wander 20 percent to 40 percent of the time, according to some estimates. The technology D’Mello and his colleagues are pursuing could be applicable for business, aviation and the military, but they are focusing in particular on combating the problem in STEM (science, technology, engineering and math) learning, where it is especially acute. D’Mello, an assistant professor of both psychology and computer science and engineering, is principal investigator for a National Science Foundation grant to address the problem. He is working with psychology professor James Brockmole and Matthew Kloser, director of the Notre Dame Center for STEM Education, on the project titled “Attention-Aware Cyberlearning to Detect and Combat Inattentiveness During Learning." The researchers’ vision is to make computer interfaces intelligent enough to spot a user’s waning attention and take action. The system’s software tracks a person’s eye movements with a commercial eye tracker, a person’s facial features with a webcam and the person’s interaction patterns. If the system determines that the person’s mind is wandering, it can pause the session, notify the person, highlight the content, display the missed content in a different format, or tag the content for future restudy. The system also has the potential to evaluate course materials on the basis of how well they engage students’ attention. A prototype of the system was developed in a Notre Dame laboratory. A more advanced system is currently being developed and tested in STEM classes in northern Indiana’s Penn-Harris-Madison School Corp. Originally published by William G. Gilroy at news.nd.edu on October 08, 2015.